Look at us, a news site writing about news. On Thursday afternoon, American heroes Simone Biles and Aly Raisman took home gold and silver in the individual all-around competition, solidifying the Final Five as some of the best tumblers around, and giving Team USA architect Martha Karolyi a very special going away present. Russia’s Aliya Mustafina took home bronze. 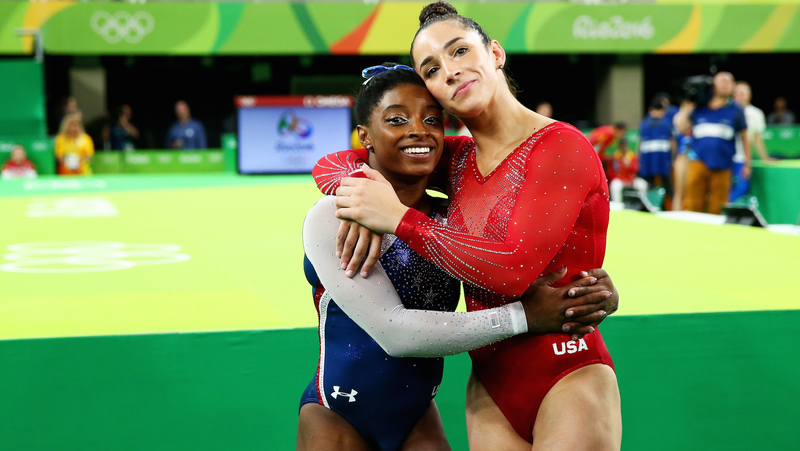 Raisman and Biles performed basically flawlessly, with Biles earning an absurd score of 15.933 in her floor routine for a total score of 62.198. Raisman received a floor score of 15.433 and overall of 60.098. After the competition was over, the usually chill Biles got choked up, so did a USA coach Aimee Boardman, and so did I! With her win, Biles joined the ranks of Gabby Douglas, Nastia Liukin, Carly Patterson, and Mary Lou Retton (other USA all-around gold winners) and solidified her reputation as being the best in the world. These women make me very patriotic!